Last week, I saw a tweet (from thousands of tweets) from StarbucksMY with regards to something they call 'Good Coffee Day'. 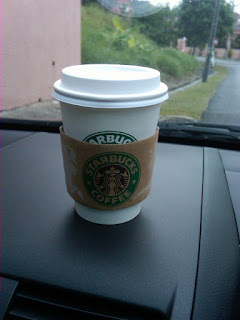 It seems that the next day, which was a Wednesday, was a day for us to get free coffee from Starbucks all over Malaysia. For 2 hours between 10am to 12pm. Pure black freshly brewed coffee. Not some latte or those sissy designer coffees but the one which can jolt you from your slumber like an elixir of youth applied to your aged skin. Yes, that is how much I love my coffee. Even willing to have to whiten my teeth every other month as coffee makes my teeth a bit yellow. So, on the day itself, I went there at 10.15am at my local Starbucks and got it for free. I actually waited to have my coffee although I had breakfast from somewhere else. I think it was a matter of principle of getting things for free. And I also wanted to send in my picture of the coffee that I got to StarbucksMY.